Tenerife 1BR Nestled on the Sun-Drenched Atlantic Coast, Resort Pool & Spa! Property 9: Tenerife 1BR Nestled on the Sun-Drenched Atlantic Coast, Resort Pool & Spa! Tenerife Studio Nestled on the Sun-Drenched Coast, Resort Pool & Spa!! Property 11: Tenerife Studio Nestled on the Sun-Drenched Coast, Resort Pool & Spa!! Tenerife 1BR on Golf del Sur - Seaside Heaven w/ Relaxing Accommodations! Property 12: Tenerife 1BR on Golf del Sur - Seaside Heaven w/ Relaxing Accommodations! Tenerife 2BR Nestled on the Sun-Drenched Atlantic Coast, Resort Pool & Spa! Property 19: Tenerife 2BR Nestled on the Sun-Drenched Atlantic Coast, Resort Pool & Spa! Tenerife Studio Located on Lush Rising Hills - Beautiful Landscaped Pool!! Property 22: Tenerife Studio Located on Lush Rising Hills - Beautiful Landscaped Pool!! Deluxe double room with kitchen and three balconies to the Plaza free wifi! Property 34: Deluxe double room with kitchen and three balconies to the Plaza free wifi! Superior double room with two balconies, air conditioning and free Wifi. Property 35: Superior double room with two balconies, air conditioning and free Wifi. 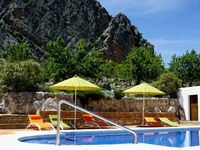 Property 40: Hotel "Corru San Pumés"
Individual room for wine tourism and relaxation. Property 41: Individual room for wine tourism and relaxation. Superior Double room for wine tourism and relaxation. Property 44: Superior Double room for wine tourism and relaxation. HOSTEL RURAL JUNCALILLO. Triple room. Property 49: HOSTEL RURAL JUNCALILLO. Triple room. HOSTEL RURAL JUNCALILLO. Double superior room. Property 50: HOSTEL RURAL JUNCALILLO. Double superior room. the cortijo is an incredible beautiful spot , surrounded by fantastic nature and close to the interesting city of Ronda and the impressive white villages. Chris and Nans make you feel more then welcome and have a thousand tips on visits and great walks. Nearby you can ride horses , climb rocks and do a lot of exciting things. For sure I will be back and even intend to go there with my team on a teambuilding trip due to the perfect location and possiblilties on activities.